In 2011, Helmdon Parish Council appointed a Tree Warden to help look after, monitor and record the trees in the parish. Northamptonshire County Council runs the Tree Warden Scheme. If you have any questions, comments or concerns please contact Helmdon's Tree Warden. For details of footpaths in the area please visit the Helmdon Paths Group page. 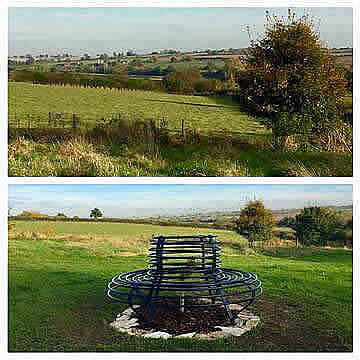 The Jubilee Wood will be four years old this month and the anniversary is marked by the installation of a new tree bench which takes pride of place in the centre of the wood with views over the surrounding country. Meanwhile, the wood itself is becoming more established. The trees are developing, some faster than others, and the new wild flower plot has been through a full season and is generating it's own seed for next year. There will be a need for some maintenance work over the winter. Some of the plastic tree guards are breaking up and need replacing. Mulch mats need lifting for the winter to allow winter rains to get to the roots and some weeding around the base of trees will help them grow better next year. If you can help in anyway please get in touch. We would like a few volunteers to look after specific groups of trees at times convenient to them. If you would like to help we would love to hear from you. This Sunday from 10 am we are organising a working party (see below) to give the Jubilee Wood a spring clean. We will be weeding around the trees and replacing any damaged canes and tree guards. We will also be replacing any missing name tags. If you can spare an hour or two we would be pleased to see you. The work will be finished in plenty of time for lunch. The Jubilee Wood Trees are coming into leaf and seem to have survived the winter well. But the mild winter means that the grass has been growing too and most of the trees need to be hand weeded to rid them of grass which is growing up inside the tree guards. Some also need new tree guards or supporting canes. This need not take too long if enough people join in, so we are asking anyone who can spare an hour or two to come along from 10 am on Sunday 17 May. If you named a tree when the wood was planted, you may want to see how it is getting on and check that the label is still there and legible. We will have some spares in case any have got lost. If you already think you can spare some time please contact me so that I can plan the activity. But we will be glad to see you if you just turn up on the day. Preparations are also going ahead to plant wild flowers in the wood later in the year. The Jubilee Wood marked its second birthday by having its grass cut and a sack full of daffodil bulbs planted at the top end of the wood. The bulbs were provided by Sue Lidgely and funded by the Parish Council. They should provide a splash of colour in the spring. Another birthday present came in the form of a £100 grant from the HYHO to fund the planting of wild flowers in the spring. We are delighted and grateful for the support which will further enhance the value of the wood in the future. Look out for news about planting arrangements nearer the time. Volunteers to help with that will be very welcome. Most of the trees are continuing to prosper but we will be filling a few gaps during the dormant period with the small stock of spares we have built up. Those who have visited the Jubilee Wood over the summer will have seen how the vigorous growing season this year has left the trees dwarfed by the grass. This hasn't harmed the trees most of which are doing well. It has made it hard to see them, however, and the grass needs to be cut back. There will be a working party, therefore, over the weekend of 20/21 September to cut and rake up grass and sow wild flowers. We are looking for volunteers on the Sunday morning to help with the raking and sowing, so if you can bring a rake or a wheel barrow along from 10am that would be very much appreciated. We will meet at the top end of the wood at the Cross Lane entrance. While most the trees are doing well a few have died, either from lack of water during the hot part of the summer or from ant damage. 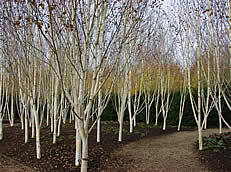 We do have replacements available and we will be arranging to plant those in November once the trees are dormant. We hope also to plant some spring bulbs at the same time. Spring has definitely arrived in the Jubilee Wood. The young trees are showing the benefit from all the rain since they were planted and are coming into leaf - led by the cherries and rowans with the oak and birch not far behind. We continue to have a remarkably high survival rate with very few failures. There have been a few, however, so if you notice that a tree you have named has died please let me know and we will find a replacement. Also one or two trees seem to have lost their name tags. Again if one of those is yours let me know and I can supply a replacement. If your are up in the wood checking your tree or just with a few minutes to spare and don't mind getting your hands dirty, it would be a help if you could pull out any grass that is growing up inside the protective tree guards. I will shortly be organising a working party to cut the grass between the trees and hopefully plant some wild flowers. Details will appear here soon. Helmdon's Tree Warden, Philip Ward (right of photo, with Roger Miles, Parish Paths Warden, left), says "It is already a year since so many of us met to plant the trees in the Jubilee Wood. Despite, or maybe because of, the the weather with the very wet winter and the hot dry summer, the young trees have survived very well. A small group have spent a couple of hours in the wood replacing the 20 or so trees that have not survived- mainly cherry trees. This is an excellent survival rate - much better than we were told to expect. Wherever possible we have replaced failed trees with another of the same species - particularly if that tree had been named by somebody- but in a few cases we had to substitute another variety. If you did name a tree and find that your tag is now attached to a different sort feel free to move your tag to another untagged tree if you want to. If you are in the Jubilee Wood at anytime, whether to look at your tree or generally, feel free to lift the tree guard and remove any weeds or grass growing next to the tree, being careful not to disturb the tree roots. This will help the trees to grow. If you have visited the Wood recently you will know that the major outstanding issue is the length of the grass. We will be organising a mowing session in the Spring when we may need some help. This will make the wood look better and keep down the weeds." Now that Spring seems to have arrived, we can see how the Jubilee Wood has survived the winter. Last Sunday a small group of volunteers checked and weeded each tree in the wood and the good news is that nearly all of them are in leaf or will be shortly. Amazingly only 7 trees have failed altogether, although a few others are not looking strong. This was expected and we kept back a few trees as replacements for any failures so there should be no gaps overall. Although the trees have survived well a few of the name tags which were not firmly attached do seem to have gone missing in the high winds. If you did name a tree and find when you next go to the wood that the tag is missing, please let me know. I have some spares and will be happy to replace it. It looks like the weather is starting to warm up a bit so we will shortly be doing an inspection of the trees in the Jubilee Wood to see how they have stood up to the rigours of the winter. We always had to expect that not all of the trees would take and we kept a small reserve of trees back so that we can infill for any that haven't made it. Meanwhile the good news is that the Woodland Trust, who provided our trees, has just reported that we, and all the other communities that took part in the programme, collectively achieved the target of planting 6 million trees to mark the Jubilee. The Trust has asked me to pass on their thanks to everyone who contributed to this fantastic achievement. A number of people have asked whether I am planning any more tree related activities this year. I would be happy to do something if people would be interested. The ideas which have been put to me so far are to create a community orchard, to do another round of tree planting if we can find a suitable site and to do a survey to identify the local ash trees so that we can monitor them for the ash die back disease. Let me know if you have any ideas. The Woodland Trust, who provided the trees for the Jubilee Wood, was so pleased that they have asked whether we would like some more trees! Before proceeding, we would need to identify suitable land. If anyone knows of a piece of land, up to an acre in size, which could be open to the public, and which could be improved by tree planting, please contact Helmdon's Tree Warden. While most us of have seen only the bad side of the recent rain, the new trees in the Jubilee Wood will have been lapping it up. The additional tree tags to name individual trees have finally arrived and the pre-ordered ones have now mostly been distributed. If you think you ordered a tag but have not heard from me, or if you haven't yet ordered tags but would still like some, please get in touch. I am pleased to say that the Parish Council has decided to fund a proper sign for the Wood saying how and why it was planted. Well over 100 Helmdon residents of all ages joined in the planting of the wood to mark the Queen's Diamond Jubilee. Just short of 400 trees were planted - oak, cherry, silver birch and rowan on land generously provided by Leigh Sparrow. Leigh planted a special "Royal Oak" grown from an acorn from the Royal Estates. Pictures of the day were taken by Charlie Binns who has posted them on the web at https://www.flickr.com/photos/leicamadman/albums/ Do have a look - there are some terrific shots. Many people took the opportunity to buy a special metal tag to name a tree for someone - this was so popular that the supply of tags ran out. More tags have been ordered and those who ordered them will be contacted as soon as they arrive. If anyone missed the chance to buy or order a tag, they can still contact me. Money raised from the sale of tags will cover the costs of arranging the event and will provide a small fund to support the future work of the footpaths Committee including the future maintenance costs of the wood. We have held back a small reserve of trees so that we can replace any which do not take straightaway. I would like to express my thanks to everyone who took part and especially those who put in so much work to organise and assist on the day. 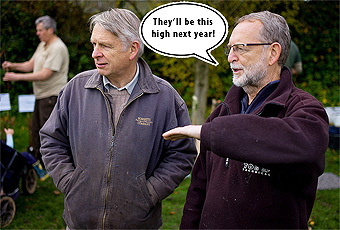 Plans for the planting of Helmdon's Jubilee Wood are developing well. 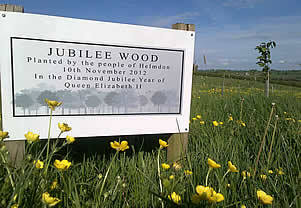 Come along on 10 November to help create our new wood to mark the Diamond Jubilee. 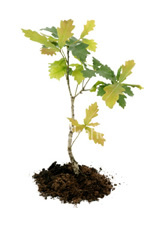 Thanks to the Woodland Trust we have 400 trees to plant – Cherry, Oak, Silver Birch, Rowan and a special oak from the Sandringham Estate. Following news of the Ash Die Back disease, the plan to include Ash in the mix has been dropped but the Woodland Trust will provide extra trees of the other species. Planting will take place from 11am to 3pm in the field at the end of Cross Lane, just below the Wappenham Road. Access is from either of the two footpaths which will be sign posted to the Jubilee Wood on the day. Bring the family and a spade and plant as many trees as you want. Full instructions will be provided and a spade if you cannot bring your own. Thanks to the Sports Club car parking will be available at the Sports Ground. Please be careful when crossing the Wappenham Road. No car parking available in Cross Lane. We will be selling special aluminium tree tags for £2 to help cover our costs. These would be ideal for naming a tree for a child or in memory of someone. Tags will be available on the day. If for some reason you can't be there on the 10th but would like to name a tree for someone please contact me and I will make arrangements with you do it at some other time. Leaflets are being delivered door to door but stay in touch with the latest information updates here on on the website. See the location and read details of the planting day [on poster]. Helmdon's application to be part of the Woodland Trust's campaign to plant 6 million trees to mark the Jubilee has been successful. We have been allocated 420 trees and they should be arriving at the beginning of November. Now the planning can start in earnest. The trees have to be planted somewhere they can be enjoyed by the public and we have identified a site close to the Wappenham Road and two existing footpaths. We want to make the planting a fun event and we hope that lots of you will want to get involved either as individuals or as part of one of the Helmdon groups I am inviting to support the project. If you would like to be involved please contact me. For anyone who would like to help with the organisation there will be a meeting in the Bell next Monday 24 September at 7.30pm. I will be keeping people up to date through this website and other means. Please look out for further information and save the date - 10 November if you want to take part.